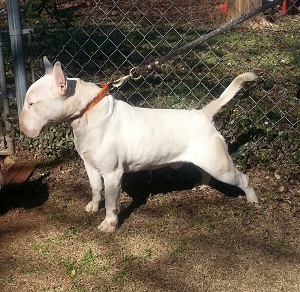 Boss Bull Terriers is the premier breeder of classic bull terriers in Montgomery, Alabama. This loyal English breed is well known for its agility, affectionate and protective demeanor, as well as their strength. For more than a century, English Bull Terriers have enriched the lives of countless households and have been celebrated by professional breeders and casual owners alike. Our rigorous breeding policies ensure the finest bloodlines and healthy, exuberant pups. Male breeders have been selected for temperament and build, and we offer the most popular colors of the breed with Red, Black and Tan, Brindle, and White sires. Studding services are available, and we encourage all interested owners to visit our contact page to request more information. Please take a moment to view our galleries and get to know our males and females. To learn more about our available English Bull Terrier puppies for sale, Contact Us Today for information. Puppies? Stud Service? General Inquiry? Let us know how we can help! We’re here to help you find your next best friend! I always wanted a Boss Bull Terrier ever since I saw one on an episode of Friends in the background, I had to have the perfect one. Thanks for matching me up with my puppy.